Gianna Rodriguez is a visual and performing artist, choreographer, and educator living in Baltimore, MD. In 2007, she graduated from Hampshire College with a B.A. in the Liberal Arts and in 2014 she received a Masters in Education, Art k-12, from Goddard College. For her work with Baltimore Youth Arts she has received fellowships from the Robert W. Deutsch Foundation and the Open Society Institute - Baltimore. Leisha Winley is the Deputy Director of Baltimore Youth Arts. She was a 2017-2018 Baltimore Corps Fellow. Leisha holds a Bachelor’s degree in Communication and a minor in Public Leadership from the University of Maryland, College Park. Bomin Jeon is a multi-disciplinary artist from Seoul, South Korea who is now based in Baltimore, Maryland. 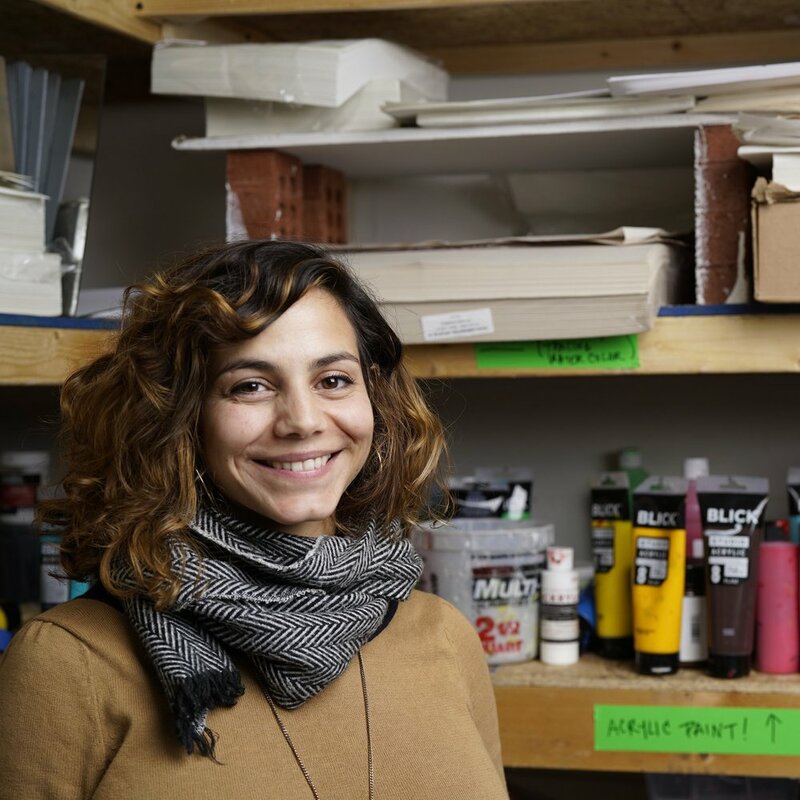 She received BFA in Interdisciplinary Sculpture at Maryland Institute College of Art and received France-Merrick Fellowship for 2016-2017. She is also an organizing member of Press Press, an independent publishing initiative started in 2014 by the co-organizer Kimi Hanauer. Luz Maria Orozco (b. Medellín, Colombia) is a Baltimore-based artist, organizer and yerbetera. They are currently studying Interdisciplinary Sculpture with a concentration in Printmaking at Maryland Institute College of Art and a received the France-Merrick Fellowship for 2018 & 2019. Orozco's practice also extends to teaching, organizing and activism around the themes of racial/social justice, immigration and incarceration. Some projects include ongoing collaborations with Roots & Raíces Festival and Get Your Life! Productions along with other youth-based organizations. Jonathan has been a staff member of BYA since July 2016, first as the VISTA Studio Apprentice Program Coordinator, and currently as the Youth Opportunities Adviser. Jonathan helps connect BYA participants with pathways to employment, education, and training in order to help them achieve success. In addition to their work with BYA, Jonathan is an actor and teaching artist, and has worked with local theatre companies such as Baltimore Center Stage, Everyman Theatre, Chesapeake Shakespeare Company, and Single Carrot Theatre. Margaret Huey is a Thai-American cartoonist and educator based out of Baltimore, MD, forged in equal parts by manga, metal, mythology, and other things that don’t start with M. Her practice is founded in making genre fiction stuffed with queer, decolonial, and feminist ideals that try and help everyone be a little more excellent to each other. Brandon Buckson is a Baltimore born artist working out of East Baltimore. Muralist and youth mentor Brandon aims to encourage future leaders to feel empowered and hopes to spread love through art. Gianna Chun is an artist from Hong Kong and Singapore, she is now based in Baltimore studying at Maryland Institute College of Art (MICA) for her BFA in photography. Growing up in Beijing, the amalgamation of different cultures has led her work to address the nuances of identity through photography and fibres. Exploring relationships, journeys, intimacy, growth and change, especially through the LGBTQ+ community, cultural differences and societal pressures.